Mary Quant’s first boutique, Bazaar, opened in London's King's Road in 1955, launching a successful fashion career. Her youthful easy-to-wear clothing became so popular that in 1963, she launched a lower-priced ready-to-wear range called 'Ginger Group'. She also entered into licensing agreements with manufacturers to produce hosiery, underwear, cosmetics and accessories bearing her name. Almost anyone, whatever their income, could spare the money to buy a pair of 'Mary Quant' stockings or a lipstick. This enabled girls who could not otherwise afford her clothing to feel in touch with fashion, and made Mary Quant into a household name and a commercial success. Her contribution to British life was marked by a retrospective exhibition at the London Museum in 1973. The exhibition included many of Quant's most revolutionary garments, some remade as facsimiles if original ones could not be found. 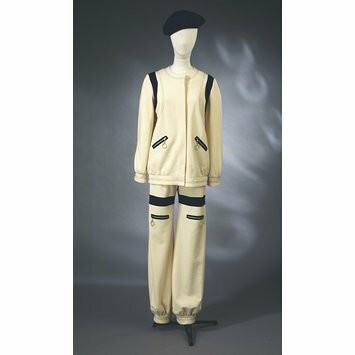 This 1966 cream and navy wool trouser-suit was one of the outfits remade. It looks remarkably like a modern tracksuit, and was based on sports and utility wear. Cream wool jacket and trousers. Inset navy bands around thighs and armholes. Collarless jacket with rounded neck, zipper front, sleeves bloused slightly into cuffs. Welt pockets outlined in navy at hips and at knees on trousers, zipper access with large O ring pulls. Ankle cuffs on trousers. 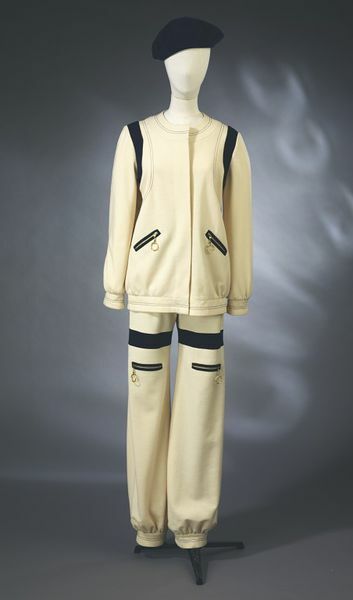 This cream and navy wool jumpsuit looks very like a modern tracksuit and is based on sports and utility wear. Trouser suit. Quant, Mary. 1966, remade 1973. White wool with navy bands & zippers.